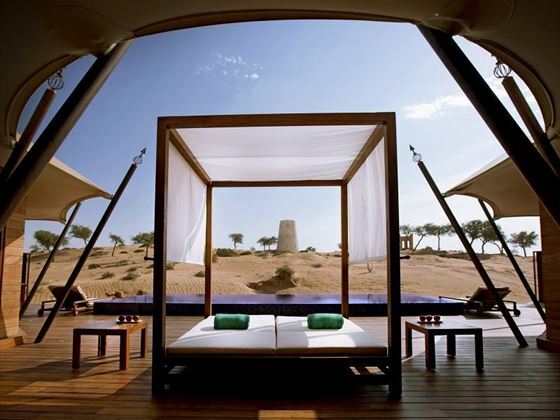 The Ritz-Carlton, Ras Al Khaimah, Al Wadi Desert. Book at Tropical Sky today. 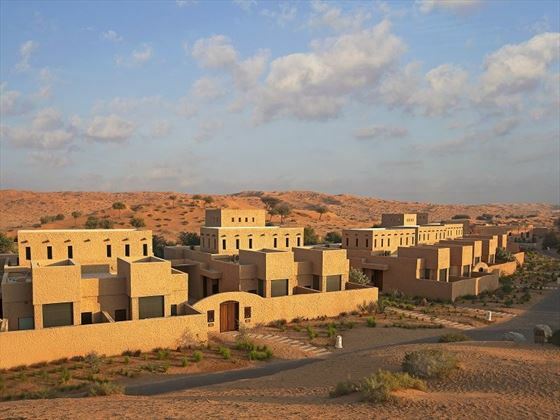 Located on its own private peninsula, The Ritz-Carlton, Ras Al Khaimah, Al Wadi Desert is a truly romantic destination with a host of beautiful views and extravagant amenities. With a stunning stretch of beach for guests only, luxurious Bedouin-style tented villas and dynamic Arabian cuisine sensations; this is the perfect paradise for couples to enjoy an intimate holiday. The Al Wadi Spa will draw you in with its natural remedies and luxurious treatments, providing ultimate relaxation and revitalisation for the body and soul. Try the unique herbal pouch massage for a blend of fresh, local ingredients to moisturise your skin, or watch the waves lap onto the beach as you enjoy a hot stone massage. 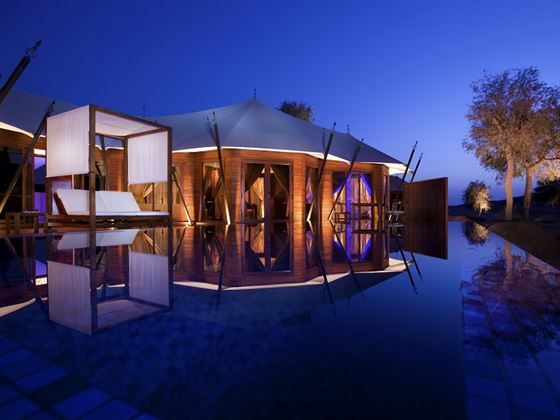 For unlimited Spa treatments, book yourself in to the lavish Spa Sanctuary Tented Pool Villas, which also have their own plunge pools and decking overlooking the Arabian Gulf. Complimentary WiFi is available in all of the beach tented villas, complete with Middle Eastern décor, beach cabanas and unforgettable views of the sweeping ocean. Nestled on its own little island, you'll need to reach the resort by speedboat. This luxurious resort is located on its own remote beach peninsula in the city of Ras Al Khaimah, which can be reached either by land or by boat. 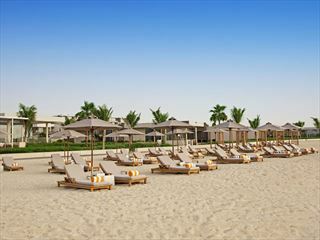 With stretches of white sand, the azure waters of the Arabian Gulf and lush desert greenery, this is a true paradise. This secluded enclave offers a peaceful ambience and the beach and gorgeous ocean is the perfect backdrop for a couples holiday or honeymoon. Close-by is the Al Hamra Golf Club, an 18-hole golf course only a 10 minute walk away, or you can take a short seven minute drive to the bustling Al Hamra Village with its lovely marina and shopping centre. 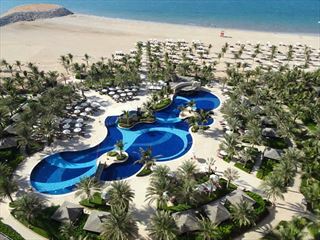 The resort is also only a 12 minute drive to the striking Al Marjan Island boulevard; a group of four small islands that are known for its pristine beaches and pretty promenades, or if you fancy a fun break from your beach cabana, the thrilling Ice Land Water Park is a 13 minute drive away. Al Rimal Pool Villa - Luxurious 158sqm villas featuring a private pool overlooking the desert. Al Rimal Enclosed Pool Villa - Gorgeous 158sqm villas with a private covered pool. 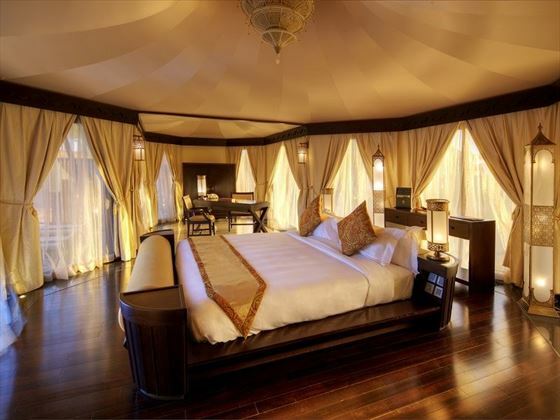 Al Khaimah Tented Pool Villa - Elegant 253sqm villas featuring a private pool and wonderful desert views. Al Sahari Pool Villa - Beautiful 253sqm villas nestled in a remote location, with open desert views and a private pool. Al Waha - Meaning 'oasis' in Arabic, this traditional restaurant serves up flavoursome international and Arabic cuisine in an authentic Middle Eastern setting. Open 6.30am-10.30pm. Closed Sundays for dinner. 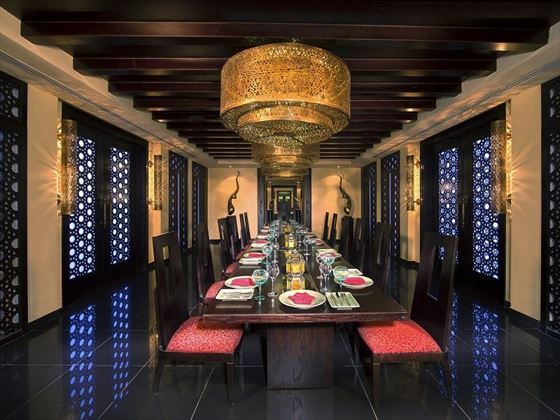 Safran - Overlooking a waterhole regularly visited by desert animals, this fine dining Indian Restaurant has a beautiful Arabic setting. Open 6.30pm-10.30pm. Closed on Mondays. 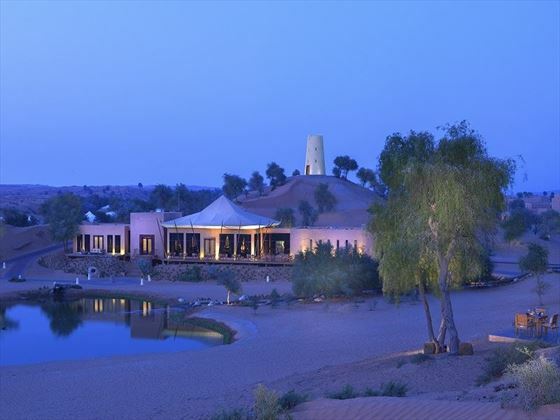 The Tower - Reminiscent of an Arabic watchtower, this private dining area overlooks the endless desert as a dedicated chef cooks up a delicious feast. 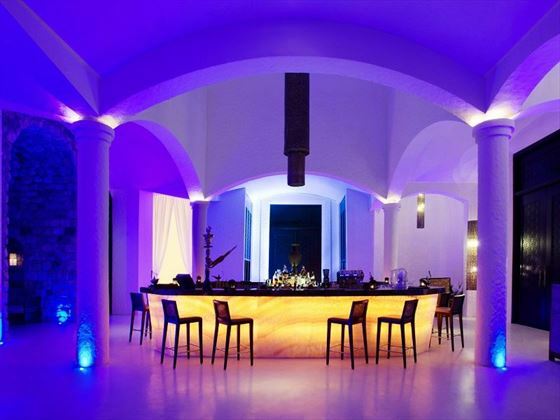 Samar Lounge - A two storey lounge area featuring ambient lighting, little cosy nooks, and a selection of fine wines, signature cocktails, and cigars. Moon Bar - Found on the top deck of Samar Lounge, the views here are truly spectacular, especially when lounging on a day bed as the sun sets. 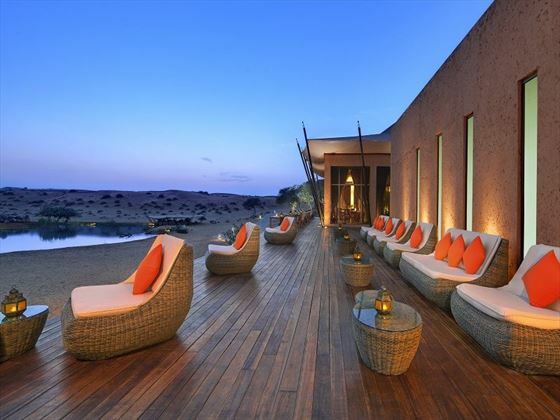 Dining on the dunes - For the ultimate romantic experience, you can enjoy an Arabic and Western inspired BBQ on the sundunes, with a private chef and butler. 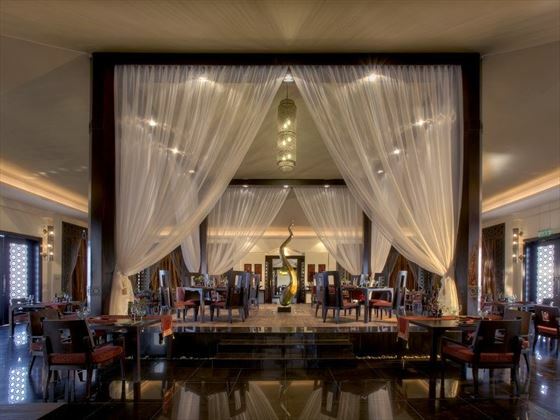 This opulent resort is home to the luxurious Al Wadi Spa, offering natural, holistic remedies and treatments whilst overlooking the Arabian Gulf. There are six tranquil Arabian Spa Treatment Pavilions to relax in as you revitalise and enjoy all this magnificent spa has to offer. Moisture Boost – Comprising of a body massage using Herbal Pouches dipped in sesame oil, an Almond Powder Dry Body Scrub, a Yoghurt Face Cleanser and a Honey Orange Face Massage and Cucumber Face Mask to rejuvenate and moisturise your skin. Hot Stones Body Massage – Cleanse your body of toxins with this calming 90 minute massage using heated stones, along with Clarity Oil which blends sesame pol, the desert plant of jojoba and Vitamin E.
Essence of Earth Body Massage – It’s your choice of oil for this calming 60 or 90 minute massage, using thumb pressure and long strokes to improve your physical and mental wellbeing. Next to the main restaurant’s terrace lies the resort’s stunning infinity pool, which overlooks the ocean and provides tasty refreshments. Each villa has its own plunge pool and sun lounger with a mattress, and can be accessed from the spacious decking. The resort is located on its own beach peninsula, so the stretch of white-sands surrounding the resort is for guests only. 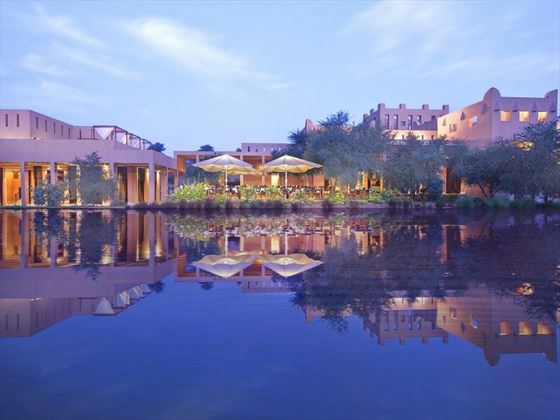 Though children are welcome, The Ritz-Carlton, Ras Al Khaimah, Al Wadi Desert is a grown up and romantic resort, so it might not be perfect if you’re bringing younger kids with you.